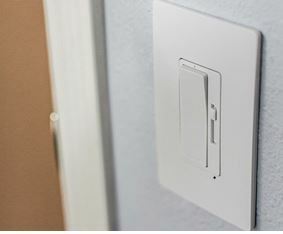 radiant® Tru-Universal Dimmers do something today’s dimmers don’t: they simply work – with virtually any dimmable lamp, load, and fixture on typical residential and light commercial wiring (with the exception of 0-10V LED drivers). Once a user selects the lamp type, the dimmer’s self-calibrating technology automatically sets the minimum voltage of that lamp. That means no more flickering lights, no more frustrated customers and no more unnecessary callbacks. And because it’s the one product in the category that lives up to its universal name, it dramatically reduces the number of SKUs as well. Ideal for residential and light commercial applications, the radiant® Tru-Universal Dimmer is the simple solution to all your customers’ dimming challenges.